2 Comments on The Playoffs are Here!!!! The NBA Playoffs have begun so it is time to look at the rundown of the results and what that means for the future of each series. I just want to start this post by saying the referees are terrible. They need to let the old school NBA players referee the game so it can be the playoff basketball that we love to see. The calls that were made last weekend were a mess unlike anything I have ever witnessed before. I just wanted to throw something at my TV. But let’s get to the real point of this post. The Clippers and the Warriors played last weekend. They solidified what I wrote, that they would be best for the NBA and game one really showed why. As soon as the game started David Lee got into it with Blake Griffin. This game magnified Chris Paul’s struggle on offense and defense, and because of it I really don’t see the Clippers winning the series. Yes, Blake Griffin only played 19 minutes the entire game, but let’s be real. He is not the entire offense. They still have Jamal Crawford, JJ Redick and CP3 on the team. Free throws did not hurt them because Deandre Jordan even hit his clutch free throw. I do have to reiterate CP3 is a liability on defense. He can’t check Klay Thompson, who had him in the post the entire game. He can’t check Stephen Curry because he has to save his energy for offense. Curry ran him the entire game like he was the second coming of Reggie Miller and Richard Hamilton. If CP3 can’t get it together, the Warriors definitely have the weapons to win in seven games. After watching the Pacers versus the Hawks I realized the Indiana Pacers are the worst team in basketball. They just didn’t want to be in the playoffs. How do you become the number one seed, let Atlanta come into your house, and easily make you look like a high school team? Roy Hibbert shot 1-4 in the first half and didn’t even show up in the second half until there were 3 minutes left in the 4th quarter. How many times do I have to sit and watch Lance Stephenson look like he does not want to play team ball anymore? How many times do I have to watch David West look passive and not shoot the ball? I saw a team that does not care and it’s sad. Coach Frank Vogul showed no passion and anger toward his team and the problems they were having. I can’t believe that he did not take his star players out of the game when they played like straight garbage. Atlanta came into Indiana like they were playing at home. I swear Jeff Teague looked unstoppable on the court. If the Pacers don’t get right on the court, they will get put out in five games. They still have to go to Atlanta and they are not that good of a road team. The Toronto Raptors versus the Brooklyn Nets was a very interesting game. It was probably the funniest game I have ever witnessed in all my years of watching basketball. The Raptors GM yelled “F*** the Brooklyn Nets!” at the crowd outside of the game, then retracted his statement. My advice: Man, it’s the playoffs so say what you feel. 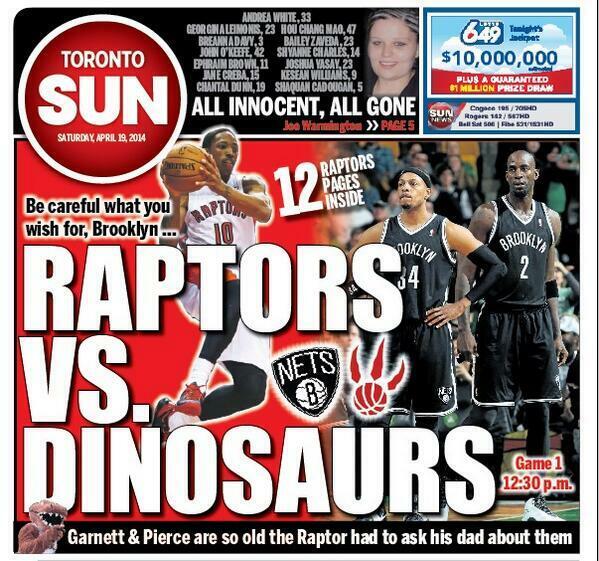 The Toronto Sun’s backpage read “Raptors vs. The Dinosaurs.” I mean it just cracked me up. Paul Pierce didn’t have a great game, but oh man, did he show up in the 4th quarter and display the skills that led Shaq to start calling him, “The Truth.” He showed that they were determined to win and they want to see Miami in the playoffs. I’m not saying that the Raptors are not going to make it a good series, but the Nets are just too experienced with the veterans they have on their squad. Toronto will be a good team for years to come but they will not beat Brooklyn in this series. Brooklyn will win in six games. The Spurs versus Mavericks series is going to be great because watching Tim Duncan versus Dirk Nowitzki is always a great matchup. I can honestly say Duncan looked like he had some youth juice because he was up and down the court like he hasn’t been in the league for 15 seasons. Thank you Popovich for making sure that Duncan looked good on the court. Tony Parker got to the lane with ease the entire game and could not be stopped. He scored 16 of his 17 points in the first quarter inside the paint. Monta Ellis looked nervous and it showed. He could hardly make a bucket. He shot 4-14. Dirk was not hitting his jumpers, only scoring 14 points and Vince Carter just doesn’t look like he even cares to win. In the end the Spurs will win the series in five games. Another great series is the Wizards versus Bulls. The passion surrounding that game is awesome. I love the way Joakim Noah played because he makes you want to scream with him. Even though Noah has intensity, he cannot check Nene. Tahj Gibson was a great player in game one grabbing offensive rebounds. The Bulls will not beat the Wizards just because John Wall, Bradley Beal, and Nene did a great job playing against that tough defense. However, Boozer does not play any defense at all so that will hurt them in the series. DJ Augustin and Kirk Hinrich tried their best to D-Up but those boys were just too big and quick for them. I believe the Bulls will lose this series in six games. After watching the Trailblazers versus Rockets all I have to say is the Trailblazers will win this series and it will be a great run. Lamarcus Aldridge scored 46 points and Damion Lillard scored 31. That is 77 points between the both of them, and that’s not even adding in Wesley Matthews and Batum. But let’s put it out there – no one on the Rockets can check Aldridge and that’s all they need. James Harden shot 8-28 and still acted like he actually contributed to the team. Yeah, I watched Dwight Howard put up 27 points, 15 rebounds, but I also saw him shrink when they needed him. He cried the entire game because Robin Lopez stayed on him. It was great to see Robin Lopez play tight defense and get on Dwight’s nerves the whole game. I especially loved how Wesley Johnson got in James Harden’s head and made him overshoot the entire game. It will come down to the wire, but the Trailblazers will win the series in seven games and show the NBA that they should be considered contenders. The Thunder versus Grizzles has to be the weakest series that will be on TV. Durant and Westbrook just went to work and dominated the entire time. It makes me not want to watch. Ibaka was just on a mission blocking everything in sight. He got in players faces and challenged shots. I really don’t have that much to say because the Grizzles cannot score on them. It’s Kevin Durant, what more do I have to say? I really don’t want to talk about the Heat versus Bobcats because it is basically a waste of time. I’m not saying a waste of time like the Heat will just dominate the series. I’m saying a waste of time because everyone and they mama is a Heat fan and the NBA wants the Heat to win because it’s a business. Most of the Heat fans weren’t fans until LeBron went to the team anyway. Band-wagoners are just what they are. A true fan of the sport can see the off-things that happen, especially with the referees. The Bobcats started a run, were up 10, but the refs started with the bogus whistle blowing to get Miami back in the game like they always do. There were four straight calls that weren’t even fouls, but it sent LeBron to the line and took the momentum away from the Bobcats and everything changed from that point on. It was ok for LeBron and company to run and dip their shoulders into the defender to get the foul. AMAZING! They might as well just put Miami in the Eastern Conference Finals and let everyone else fight to get there. The Playoffs this year will make for some good entertainment, with the exception of a few series’. We will see the referees tame down some of the points in the games that can be great momentum changes. I look forward to seeing who will make it to the Finals this NBA season. We have just barely scratched the surface thus far.